Personlized graduation keychain 2018 with hat 2018. I can customize Hat 2018 and bar in all 3 colors - Silver. Rose gold and Gold. Please choose from the drop down option. You can custom bar with hand stamp - Name or Date or With 1 Initial and 1 Birthstone for same price. Please do mention all your custom details in seller's comment or note section at the time of checkout. Good luck Graduate!! Graduation Cap, Graduation Gift, Graduation Gift for Him or Graduation Gift for Her. 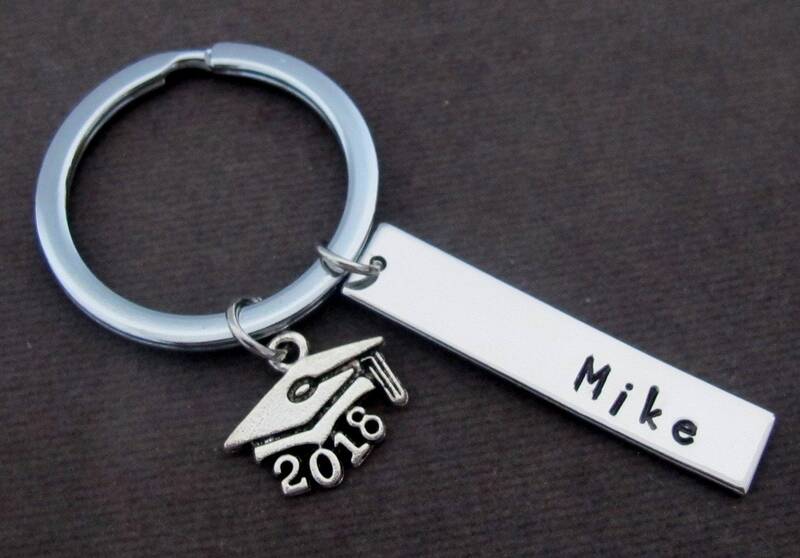 Personalized Graduation cap charm keychain with hand stamped Name of the Recipient. Perfect gift for the new graduates! Celebrate your graduate's success with great privelige. Very nice graduation memento! I know it will be enjoyed. Nice keychain & I know will be appreciated!